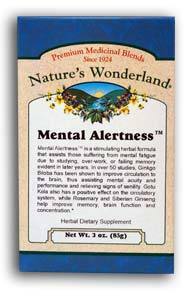 Mental Alertness™ Tea, 3 oz each (Nature's Wonderland) - Penn Herb Co. Ltd.
Don't you wish your brain worked like it did 10 years ago? Maximize your brain potential with our traditional mental performance tonics: ROSEMARY...this circulatory tonic and antioxidant spice is used worldwide to support memory and concentration; GINKGO…protects brain cells from free radical damage and increases circulation to the brain; SIBERIAN ELEUTHERO…energizing tonic helps the body cope with mental stress; GOTU KOLA…Ayurvedic "brain food" improves learning ability and mental recall. Ginkgo Biloba Leaves, Gotu Kola, Rosemary Leaves, Siberian Eleuthero. Pour 8 oz of freshly boiled water over 1 heaping teaspoon of tea. Cover and allow to steep 4-7 minutes, then strain. Drink 2-4 cups daily. To enhance flavor, add honey, stevia and/or lemon to suit your personal taste.